Universal voltage regulator for 6v or 12v systems. Has four prongs on a metal frame. This is pretty much the same as a the regulators that came stock on A35 bullet, targa, sprint, colibri, tt, classic, targa LX and A55 arrow (05 only! ), LX, ST, and sprint. Red NGK racing plug boot and wire combo. Super insulated silicone for ultimate waterproofing. 7mm solid copper wire inner core with integrated 5K Ohm ceramic resistor spark plug wire. This is about the best spark plug boot money can buy. Comes with about 20" of wire. 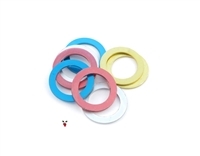 index washers for 14mm spark plugs! comes with a variety of sizes for your tuning pleasures. comes with two of each color! Blue rubber waterproof spark plug boot for 7mm spark plug wire. Red rubber waterproof spark plug boot for 7mm spark plug wire. This is a resistor type boot that uses the screw-on cap on top of the plug. Extra slim low profile digital voltmeter by Koso for checking the voltage coming out of your 12v CDI or battery. Compact, easy-to-read LCD display Displays voltage within 8-18V range. When the voltage is lower than 11.5V, the meter will flash to warn you. Grab some spade connectors, terminal blocks and shrink wrap to get the job done right! No display, just about 22" of lead wire and the copper sensor for 14mm spark plugs. Hi-temp resistant steel electrical quick connectors for 14-16 guage wire. Five male spade terminals, five female spade terminals, five ring ground terminals. Digital multi meter for testing and diagnosing electrical issues on your bike. A total must have for any tool box. Super handy test light for testing continuity and electrical connections. Use this one either 6v or 12v. The bulb inside the tool will light up to confirm that your electrical connection is working. 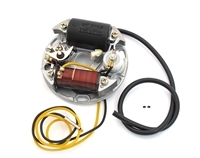 HPI regulator rectifier for keeping your lights from blowing out and for running and charging a battery. NOS switch clamps for attaching stock magura switches to the handlebars. We only have a few of these so get them before they're gone! 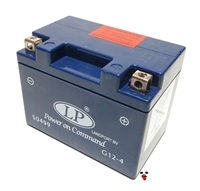 Yuasa YTX4L-BS replacement 12v battery for Tomos Streetmate. This comes with a separate acid pack and the little terminal screws. tomos OEM sealed (not lead acid) battery for all years of revival and streetmate + streetmate R! includes terminal bolts not in photo! Black rubber waterproof spark plug boot for 7mm spark plug wire. This is a resistor type boot that uses the screw-on cap on top of the plug. Three terminal waterproof connector. For the discerning over-achiever. Two terminal waterproof connector. For the discerning over-achiever. Four terminal waterproof connector. For the discerning over-achiever. New old stock CEV on/off light switch. These came on lots of Sachs, Kreidler and some Puch mopeds.